Keen not to let its tourism sector get hurt and desiring to show a strong response, Egyptian President Sisi announced less than 12 hours after a roadside bomb on a tourist bust killed 4 people and injured another 10, his forces had attacked 2 separate terrorist camps, killing altogether 40 militants. The Ministry of the interior statement read: "A group of terrorists was planning to carry out a series of aggressive attacks targeting state institutions, particularly economic ones, as well as tourism... and Christian places of worship." 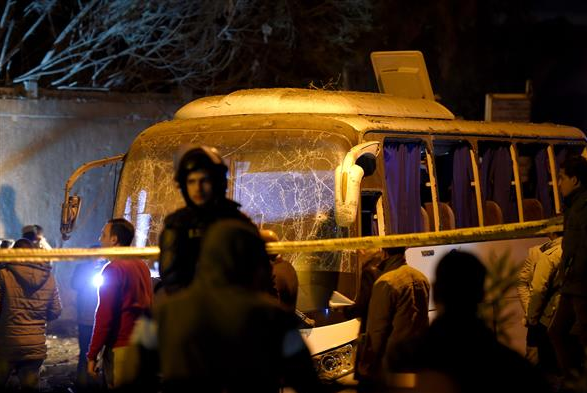 Related coverage: Egypt – Tourist Bus Bombed Near Pyramids, 2 Dead, 12 Wounded (Video). Yesterday a roadside bomb killed three Vietnamese tourists and an Egyptian guide near the Giza pyramids, one of the most visited places in the country, when it exploded just as a tourist bus passed. The incident marked the first time foreign tourists in Egypt have been killed in more than a year again. Just as other north African and Middle Eastern countries (Morocco, Tunisia and Turkey come to mind), Egypt’s tourism sector had dropped heavily in the aftermath of the Arab spring of 2011 revolutions. For Egypt, the worst blow was the 2015 bombing of a passenger jet which killed 224 people, mostly Russians. Since last year, Egypt (just as Morocco) had once again been welcoming a rising number of European tourists as prices in Mediterranean destinations (Italy, Spain, Greece and France) had gotten too much to bear for a class of European tourists and the prices of North African holiday packages was too cheap to forego. Today, many planned excursions for foreigners staying in Egypt have been cancelled as a precaution. The fact that the government forces were able to attack and kill 40 terrorists so soon after the event means that the authorities already knew of their existence. It took the murder of foreign tourists for them to act. me thinks that the gov fucks ARE LYING to protect their tourism dollars. the fact is; even if they did kill 40 suspected terrorists, there are THOUSANDS MORE waiting to attack. the mid-east is a complete pos Israel included.